Alain Normand hails from the Loire Valley, but his ancestral home is Normandy, hence his name. That makes him a Norseman—a Viking—and true to form he is a tall, red-headed man. He met Sylvaine, a Burgundian, in the wine school in Beaune. They began their careers by taking over an abandoned vineyard in La Roche-Vineuse with a métayage contract, a common agricultural practice in France whereby the landlord is paid in wine. Today, Alain works the vineyards, makes the wine, and sells off the landlord’s portion to négociants. He keeps the finest for himself. Sylvaine handles the office work when she’s not handling the two children. 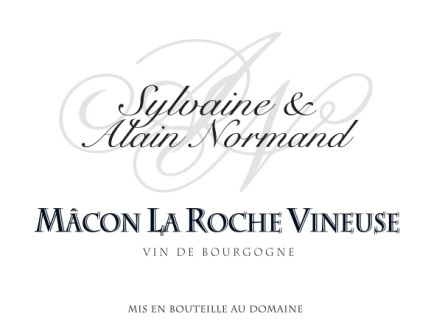 Domaine Sylvaine & Alain Normand is a typical family domain operation. 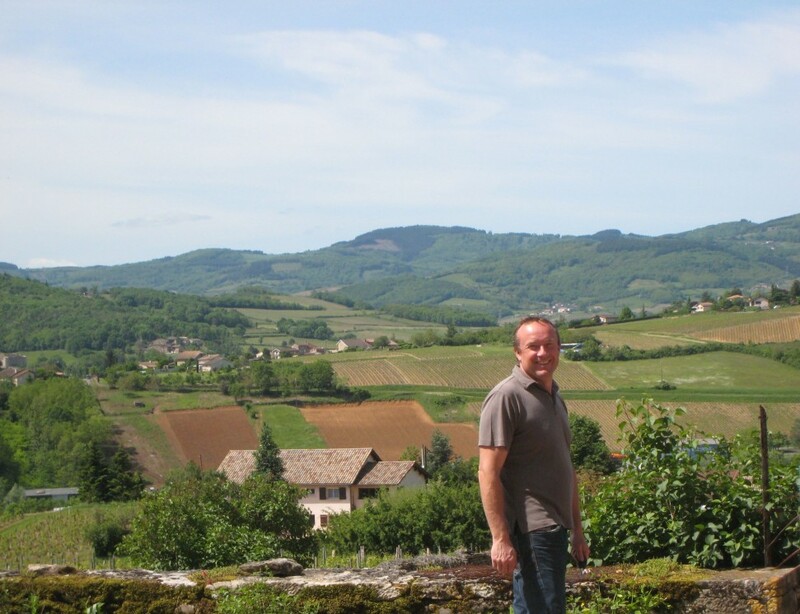 Alain Normand works eleven hectares (27 acres) in La Roche-Vineuse, an old village nestled on the steep flank of the huge limestone outcropping that gives name to Vineuse. This village sits astride the small pass that cuts through the Mâcon ridges and leads to Cluny, the seat of power for the Benedictine order of monks in their Medieval heyday. On his hillsides in Vineuse, Alain farms Chardonnay, a little Pinot Noir for AOC Bourgogne Rouge, and a little Gamay for AOC Mâcon Rouge. In 2003 Alain and Sylvaine inherited a tiny parcel of Pouilly-Fuissé in Solutré from Sylvaine’s father and made about a pallet of wine every year from it. 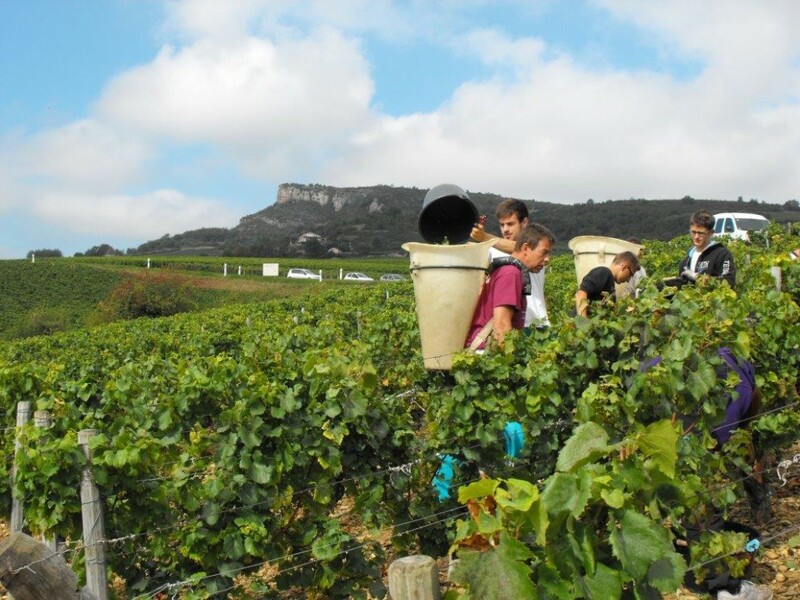 After the harvest of 2009, they inherited the rest of Sylvaine’s family vines—seven hectares (17 acres) total. Three (7 acres) are in AOC Pouilly-Fuissé divided between mostly old-vine parcels in Chaintré (vines are 50-60 years old) to the south and Solutré (vines are 30 to 80 years old) in the northern half of the appellation. The remaining four hectares (10 acres) are on the lower slopes of Chaintré and Solutré and are classed as Mâcon-Villages. The Normand Pouilly-Fuissé production is now divided along the lines of the Mâcon production: an old-vine cuvée made in old and new oak, and a classic cuvée made in vat. All four cuvées are raised with long lees contact. It’s worth noting that the two Pouilly-Fuissés bottled at chez Normand all come from the Solutré vineyards. The wine from the Chaintré, a warmer zone, is sold off to the négoc. Chardonnay This comes from roughly 13.5 acres and is made in a distinctly artisan style with native yeast in vat and an extensive upbringing on its fine lees (that spicy zesty quality in the finish of the wine comes from this lees contact). The bottling is usually in the summer following the harvest, but can easily wait until the autumn if the wine isn’t ready. Production averages 2,500-3,000 cases in normal years. Mâcon La Roche-Vineuse Vieilles Vignes Chardonnay This comes from roughly five acres of vines planted in the late 1940s after the war. The wine is made in a combination of old and new barrels, and normally is bottled without fining or filtration. The élevage can be extensive; the 2010, for example, was bottled in March of 2013. Chardonnay The Normand holdings in Solutré are divided among 15 parcels, and the wine for this, the classique, come from 30-40-year-old vines. Normally, the wine is made in tank, but in some years a few barrels are also used. Production averages 800 cases in a normal year. The famous Rock of Solutré dominates the skyline, and vineyards come off of its south-eastern flank to dip into a little valley and then climb back up the opposite side to face northeast. The highest and lowest vineyards are classed AOC Mâcon; the middle of the flanks are reserved for Pouilly-Fuissé. Chardonnay A selection of 2 old vine parcels totaling 2.5 acres This is a selection of two old vine parcels (in Les Craies and Les Vignerais) totaling 2.5 acres, planted in 1930 and 1960, and facing south. Native yeast, raised in a combination of new and old barrels on its lees for an extended period, and normally bottled without fining or filtration. Annual production averages 400 cases.